flu prevention | To Health With That! Flu season is here and as you know I’m not a huge fan of the flu shot, but there are some great natural ways to beat the flu. The best strategy is always to not get it, but if you do get the flu then we can also work on reducing the severity of the symptoms. What is The Flu and Why is It Such a Big Deal? The flu is actually an illness caused by the influenza virus, which passes around through the human population every year. This virus is so tricky because it spreads easily through respiratory droplets (sneezing, coughing, breathing loudly) as well as through contact with frequently touched items like door handles, door knobs, store counters and credit card machines. The influenza virus happens to mutate incredibly easy and has groups of interchangeable parts so it can sort and re-sort itself in unpredictable ways. It can also interchange parts with strains that cause disease in birds (avian flu) and farm animals (swine flu). All in all it’s unpredictable and causes a pretty severe set of symptoms in humans that also varies from year to year. Each year the strains of flu that sweep through the population are slightly unpredictable, but we take our best guess at what might be out there and then make the vaccines against that. How Can You Prevent the Flu Naturally for Yourself and Your Family? Wash your hands frequently when you’re around lots of people, before every meal, and before touching your eyes, nose or mouth. Cover your mouth when you sneeze, preferably sneezing into the crook of your elbow, count-dracula fashion so that your hands don’t get covered in germs to spread around. Get good sleep – your immune system will stay so much stronger if you give your body enough time to sleep and the right sleep environment. Stay hydrated – your immune system works best if your hydration status is good. Homeopathic preparations of Influenzinum can be used to prep your body for flu season and help you to fight off the virus if you’re exposed. Look for a 30C potency and take 3-5 pellets under your tongue once weekly. This is safe for kids and adults. Good natural antivirals like elderberry syrup can really help to prevent the flu even if you’ve been exposed. 1 tbsp per day for adults under normal circumstances and if you know that you had a major exposure you can take a tablespoon every couple of hours. All the good basic immune boosters like zinc, vitamin C, vitamin D, selenium, echinacea and colostrum can be used for flu as well, although they aren’t specific for the virus. 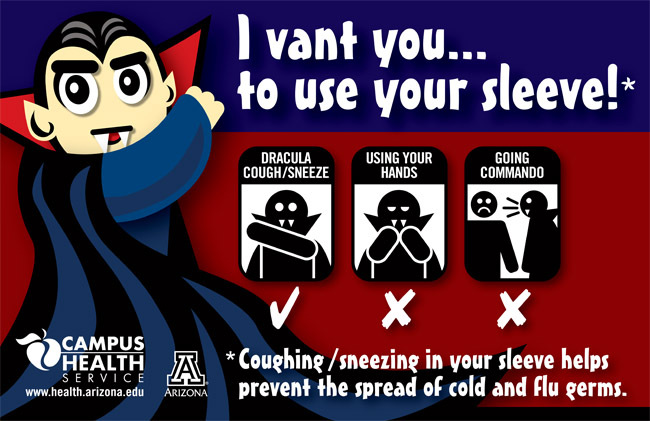 Dracula Sneeze poster from the University of Arizona Health Services. The easiest way to beat the flu is to not get it. Yeah – your boss just came back to work after being out for an entire week and the first thing he did was cough on you. Great. Just great. Not to worry, there are a few great things you can do to boost your immune system like crazy to hopefully keep the flu away. No sugar – give your body a fighting chance to keep your immune system up and eliminate all sugar for 24-48 hours. This includes table sugar, pastries, sweets, chocolate, honey, agave nectar, juices, fruit and sugars in other foods. Aim for 10 hours of sleep. Nothing helps your immune system like sleep does. Treat yourself to some at-home hydrotherapy like the wet sock treatment. If you haven’t heard me talk about this before – it’s AWESOME. This will be the entire topic of next week’s post. It’s just as crazy as it sounds and it’s also the best free immune boost out there. Use some saline nasal rinse in a neti pot or just a regular nose spray and also a salt water gargle for your throat. This helps to make these environments less friendly to the flu virus. If you can do this right after your exposure then all the better, but if not then do it in the evening when you get home and again the following morning. 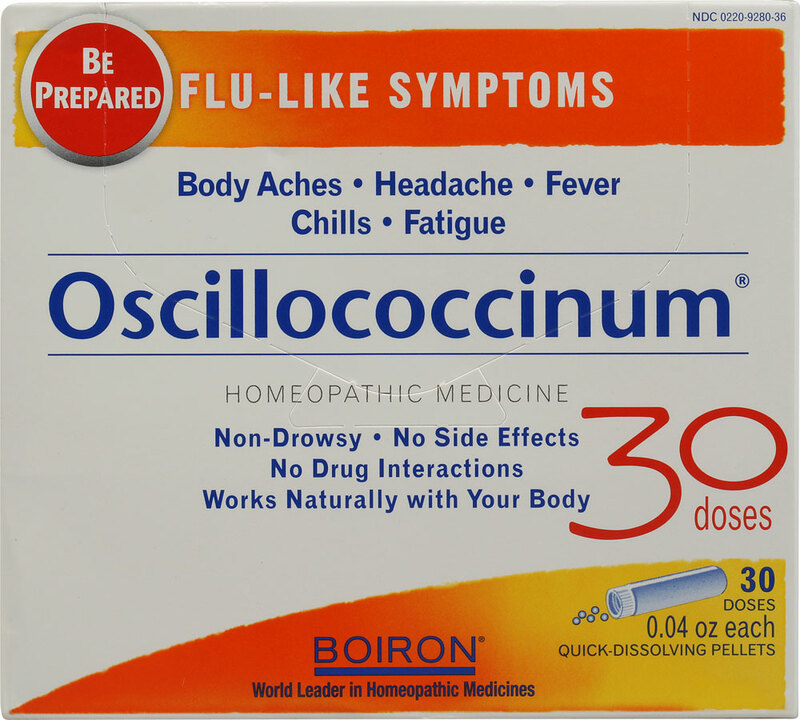 If you have some at home, the natural flu remedy oscillococcinum from Boiron seems to be able to stop the flu in it’s tracks. Just one dose after an exposure should do, but if you tend to over think things then feel free to take a second dose after 24 hours. 1 tube should be enough to dose an entire family of 4. Echinacea extract has been shown in studies to help prevent the flu, and with a known exposure you can take a dropper full of the liquid extract every couple of hours or 1-2 capsules every couple of hours for the first 24 hours. If it doesn’t kick it after that then it isn’t going to. You don’t have to do all of these, but try to really focus on supporting your body and giving it what it needs and use whatever tools you can. The most important things are avoiding sugars, sleeping and doing a good saline nasal rinse and gargle. 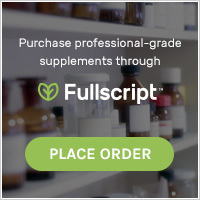 The supplements can be added in just depending on what you happen to have at home. Oscillococcinum from Boiron. A great tool in the flu-prevention kit. You tried everything you could, but this year’s virus is a strong one and you came down with the flu anyway… Here’s how to handle it. Take time off work. Most people know that when they have the fever and body aches and chills then it’s a good time to call in, but just in case. Flu needs plenty of rest to heal and it can linger if you don’t rest up front so might as well enjoy just about the only benefit to the flu, which is a few days off of work. Hydrate like you’ve never hydrated before. Fevers burn off a lot of moisture and so does all of that mucus. It is much easier to dehydrate when you’ve got the flu and much harder to fix it (plus being dehydrated gets in the way of your natural defense mechanisms and slows down your immune response). Clean foods only – for a few days avoid the grains, dairy products and especially the sugar. Lots of chicken soup and simple to digest foods can be really helpful. If you don’t have an appetite then just focus on the water and liquids – broth can be tremendously helpful. Sleep. Seriously sleep is a big part of when healing happens so sleep at night, sleep in the day, just sleep. You’re off work anyway – what could be better than falling asleep in front of a Seinfeld marathon? Elderberry syrup can shorten the duration of the flu by 24-48 hours (which is about what tamiflu® will do as well). 2 tbsp three times daily for an adult. Manage the symptoms. The congestion and stuffiness that can come with the flu gets better with NAC 600 mg between every meal. The body aches are helped by a hot bath with epsom salts, natural anti-inflammatories like turmeric or ibuprophen if you tend in that direction. Fever is generally a good thing because it’s one of the ways your immune system kills viruses, but if it starts to get too high (which is rare with the flu) then take something like acetaminophen or a tepid bath to reduce the fever. My idea of too high in an adult would be 103-104* but figure out what your feelings are about it and stick to that. 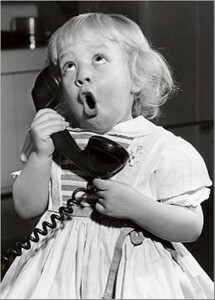 Call your mom or dad if you can. Really nothing makes you feel better when you’re sick than talking with someone beloved. Next week we’ll talk about wet socks because that one always makes people curious. All in all just take good care of yourself this flu season and if you do get the flu, don’t panic. Just look at it as a forced relaxation – sometimes your body needs that. The best natural ways to beat the flu really are the simple things like keeping a good diet, good hygiene and getting good sleep. This entry was posted in Natural Health and tagged elderberry, flu, flu prevention, flu shot alternatives, natural antivirals, natural flu remedies, natural ways to beat the flu, wet socks on November 18, 2014 by amyneuzil.